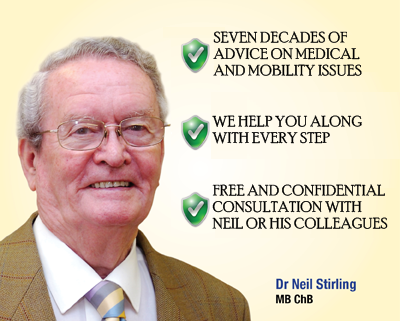 For over a decade, Doctor Neil Stirling MB ChB has been a figurehead at the Castle Comfort Group. Since his retirement as a renowned and highly respected medic, his knowledge and enthusiasm, now gives vital support to us and our customers – through his role as Voluntary Ambassador. For a refreshing, honest and pleasant way of getting help on the stairs – at the right price, along with essential information (and of course receiving the best possible service) please contact us now, read on to find out more or hear me by clicking to watch the video below. Many companies are claiming to offer top stairlifts at great prices but with lots of firms all seeming to offer more or less the same kind of thing, who can help you? How can you choose between them and who should you choose? You need someone with experience to back you. A lot of UK stairlift and comparison sites appear to be real but are unfortunately not actual companies on the street at all. Those websites just pass your contact details, such as your name, address and email on to genuine companies, like us. The problem is that they sell your details on to up to 20 different other people, so you are then bombarded by telephone sales staff from different companies all trying to persuade you who you should buy from. Those websites are unlikely to be able to give you knowledgeable advice to suit your individual circumstances, budget or staircase. Worse than that, they might resort to high pressure sales calls. I can guarantee that requests for advice by phone or through the contact page on this website will be impartial and suited for your needs. I also aim for them to be attractively priced to meet your own budget. Stairlifts are vital for those that need them. Being confined to one floor of your home because the stairs are too dangerous or painful for you to tackle can be changed by arranging for this simple device to be put in. Doctor Neil has a huge knowledge of not just home lifts and other mobility equipment, but fifty years knowledge of working with families, both young and old, and so really understands the customers needs and requirements. The individual stairlift manufacturers may know more about their specific models of lift, but the Doctor adds his five decades of NHS working and people experience to the last fifteen years of working for a mobility centre, to really understand your situation. If you or someone you care for is getting older (like myself) we can be seen as an easy target for unscrupulous mobility aids firms. I believe that thinking about stairlifts can be a significant though much needed investment. It is usually a one time purchase decision, and for this reason we want to get it right first time. Knowledgeable, free and impartial advice, from someone who understands your position can help to make this decision much easier, so that we end up with peace of mind regarding our safety on the stairs. We also need to be able to rely on a prompt response if we want servicing or information on warranties. 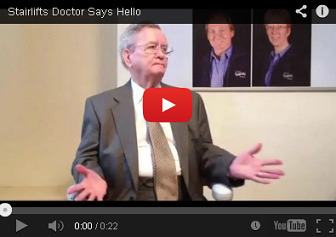 My personal promise is to look after each consumer as if they were a favoured patient of mine. I pledge to ensure that all individual needs are taken into account, and I aim to answer any stairs related question regardless of how trivial they may seem. When you are ready to proceed I can offer advice as to which model might be appropriate. Most importantly I can recommend a local company for you that can give you confidence in it’s product and many years of trouble free use.